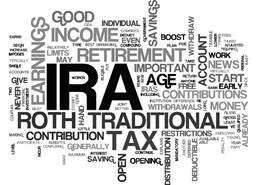 With IRAs and Qualified Plans, after the death of the “Participant” (the lifetime owner), there are required minimum distributions based on the life expectancy of the beneficiary. Often, people think that an individual must be named as the beneficiary of the retirement assets in order to use the beneficiary’s life expectancy and to prevent a forced faster distribution. But, that isn’t the case. A trust may be designated as the beneficiary. As long as the trust meets a few technical requirements, the IRS will look through the trust to its beneficiaries and use their life expectancies. One of those requirements is that the trust must be irrevocable by the death of the Participant. So, for example, if you name somebody else’s revocable trust as the beneficiary and that person survives you, that won’t work. But, if you (the Participant) name your own revocable trust, that would work because your trust becomes irrevocable at your own death. If your beneficiaries could benefit from the asset management or asset protection advantages of a trust, consider naming a trust for their benefit as the beneficiary of your IRA or qualified plan. Naming a trust as beneficiary of an IRA or Qualified Plan doesn’t need to be scary, even at Halloween.